The lovely weather here in the UK has made me start thinking about new summer clothes for the girls as all of a sudden it seems that Biba doesn't have anything that fits. Still on the positive side a growing girls means new clothes - so it isn't all bad if you love to shop like we do! This dress from www.thehedgepig.co.uk has caught my eye. It is so cute, the only downside is that the sizes don't go big enough for my lot. 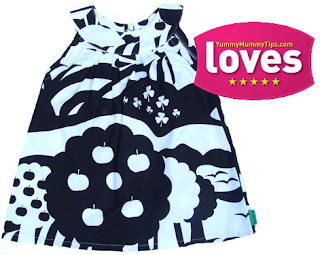 Designed by Plastisock it has a bright funky black and white apple field print and is simple but perfect. It's the kind of piece that can be dressed up or down and looks equally as good as a dress or over jeans or leggings. Made from 100% cotton all Plastisock pieces are made to the strict Oekotex standard which means that they are free from any of the nasty chemicals that seem to surround everything these days. Whilst you are checking out the dress have a good look around the rest of the site. www.thehedgepig.co.uk have a fantastic collection of bright and funky kids clothes that will make your little one stand out from the crowd. They stock a great range of labels including Urban Elk, Smafolk, minymo and my other fav Sophie4Sophie. My kids would be enthralled to see this clothing manufacturers' stylish kids collection. It seems like a nice dress for her because it's made of cotton.